Japanese publication Jump has revealed in its latest issue that Square Enix is currently developing a multiplayer action-RPG game for the 3DS called Final Fantasy Explorers. 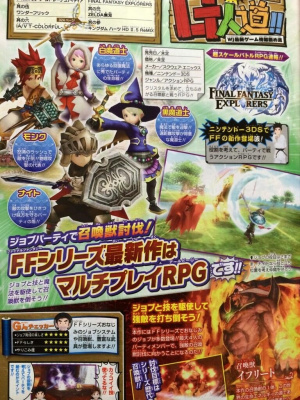 According to magazine, players will be able to select from a variety of different classes for their character, essentially enabling them to narrow down to a specific role within a team. Up to four players can form an in-game party, with the idea being that players each serves a specific purpose in order to conquer enemies. A Japanese release date for the game is not yet known, nor has it been confirmed if the game will see an international release. So this is the unannounced 3DS game? Interesting. @Azooooz No, this is AN unnnounced 3DS game. This is NOT the Miyamato announced game. This is made by Square Enix, not Nintendo. Glad to see more RPGs, but sad only for 3DS. WiiU needs RPGs too! Either way will likely get this if good. Love me some Final Fantasy. So...it's Crystal Chronicles for the 3DS, minus the stigma of the Crystal Chronicles name? Definitely interested by this. If there's one area the 3DS hasn't quite lived up to the DS it's RPGs. I'm liking the 'classic' Final Fantasy look of those characters too. Not Bravely Second? Only somewhat interested. Hope it comes to other regions. Meh, I rather have a "regular" rpg instead of one of these mediocre Crystal Chronicles games. Come on S-E, give us Dragon Quest VII already! Hoping for a western release! Vita has a huge selection of very nice MH/PSO style ARPGs, so it's nice to see that 3DS finally gets some variety as well. Hopefully this will take a more inspired approach to multiplayer than the Crystal Chronicles series. Job selection is a nice start but the game also needs to be fun. No thanks SE, bring KH3 to the Wii U. THEN we'll talk. I'm game for anything Final Fantasy related. @Peach64 I beg to differ. I love the rpgs on the ds but I've found that the 3ds has more consistently good ones. Out of the 10 plus rpgs I have all are good to great imo. Ds had to many hit or more so miss ones for my liking. Sure there was some maybe 10 total worth owning but the others just didn't quite make it for me. Radiant Historia ftw though. Best ds rpg hands down! Well the only reason later Dragon Quest games and Bravely Default came stateside is because Nintendo published them. Let's hope a similar situation happens here. It sounds like a renaming of Crystal Chronicles more than anything. Hmm, I'll keep an eye on this but will it be co-op only? That sounds interesting. Hoping for localization. This looks like it could be interesting, but it could also end up being like Crystal Chronicles. Most of the time when Final Fantasy and Nintendo get together, the results are pretty weak. I've always wanted a nice FF experience on a Nintendo system, though.... and action-RPG instead of RPG sounds good to me. All the FF content without the boring battle systems. At least, that would be nice. The whole class system sounds like it may be needlessly complex, which could ruin the experience. Whatever the case, I'll be keeping an eye on this. Well, I loved Crystal Chronicles more than I have loved the main series for quite some time (Bravely Default was a nice return, but for obvious reasons does not count as FF main series ), so I hope this will be something like CC, and gets a worldwide release. I hope it comes west! Ever since Final Fantasy for NES, I've been hooked! I really like the idea of multiplayer but I wonder if its online multiplayer or in the same room multiplayer? If it's online, that will blow my mind. You could make friends/groups kinda like in World of Warcraft (guilds that go on quests together, raid together etc). I sure hope it comes to the West! I can only hope there's a single player campaign. If so, I'm game. Hopefully it comes to the west and includes online play. Would be awesome to play with friends. Just got A Realm Reborn so that should satisfy my online FF needs but I wouldn't mind a 3DS multiplayer FF game. The original Crystal Chronicles was fantastic. I hope this is more like that one. Glad to see Square Enix sticking to their plan of more old school RPGs. Another action RPG? Sign me up. If it's as good as Bravely Default I'll buy it. 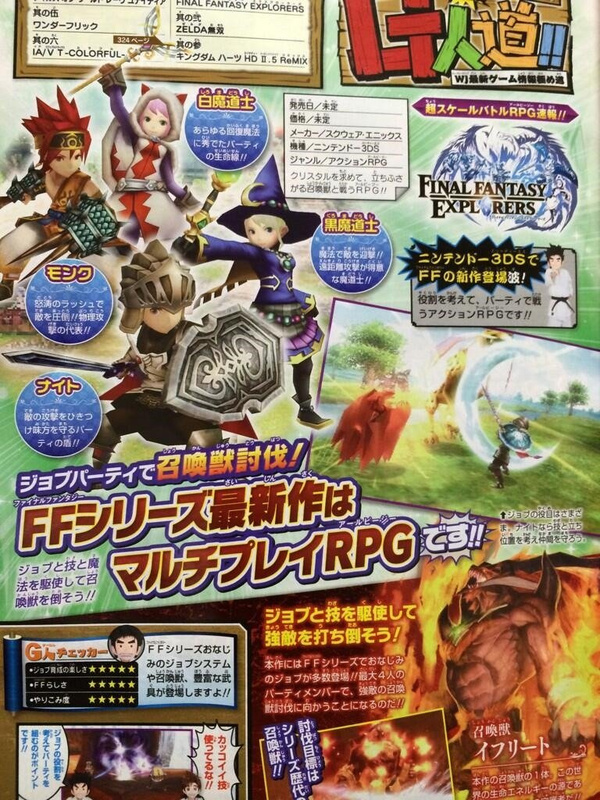 I'll keep an eye on this if it heads west...looks like it will be a fun take on the old Crystal Chronicles tales. simple maths: why spend tons of money and sell a maximum of 2 mil copies when u can spend 1/4 of the money for a 3ds release and sell 4-5 mil copies at the cost of earning 5-8€ less per sale..
@Gravedigga13 Good points and pretty much what happened with the PS3, its only now at the end of its life have we finally had a flood of RPGS and still have P5 to look forward to. Luckily Nintendo have 2 (3?) 1st party dev groups that specialize in RPGS that could contribute. The chances of RPGS in general this gen across all systems is going to be very low outside of indie, eshop/psn/xbox titles, ports and remakes. But at this point i'll take what i can get where ever its coming from. How about Square Enix support the WiiU too! I am SO picking this up whenever it comes out. Sounds interesting, I'll definitely pick this up if its multiplayer supports online. If not, I'd probably get it after buying all of the games I want like Monster Hunter 4 Ultimate. This seems like a pretty interesting game, but I won't get my hopes up until I see more of it in action. Sounds goods, but what about Dragon quest7 ? Could be like Bravely Default or could be like the new final fantasy games. Oh please get international release, I'm direly in need for something like Crystal Chronicles on the 3DS. And hopefully have both local and online multiplayer. There is a God. I was asking for this just last night. @SeanCrosser Exactly what I was thinking. There are four Dragon Quest games out in Japan. Instead of localising any of those we get another Final Fantasy. C'mon squeenix. C'mon. I worries me that they’re billing this as a 3DS MMORPG. I appreciate the art style and hope the FF franchise relearns some things from Bravely Default’s success but I have zero interest in paying a subscription fee for a game. I'm sure we will see it come to the NA and EU. @Spoony_Tech I agree on the DS titles. My personal favorite was Dragon Quest X. Then those that followed were Phantasy Star Zero, the Final Fantasy Remakes, the Dragon Quest Remake, and a little gem called Infinite Space by sega which was just awesome. Now as far as this goes I'm all over it. Hope its in 3d and has MMORPG written all over it. No matter I'm buying Love Square. Heroes of Ruin caught way to much flack back when it was released. It was a good game that suffered from a short story mode. To me it was well worth the price of admission and brought us together for some really good online multiplayer play which was just about flawless. I hope they can take that idea from Heroes of Ruin or ideas and bring us something epic. You go Square Enix! We love ya!